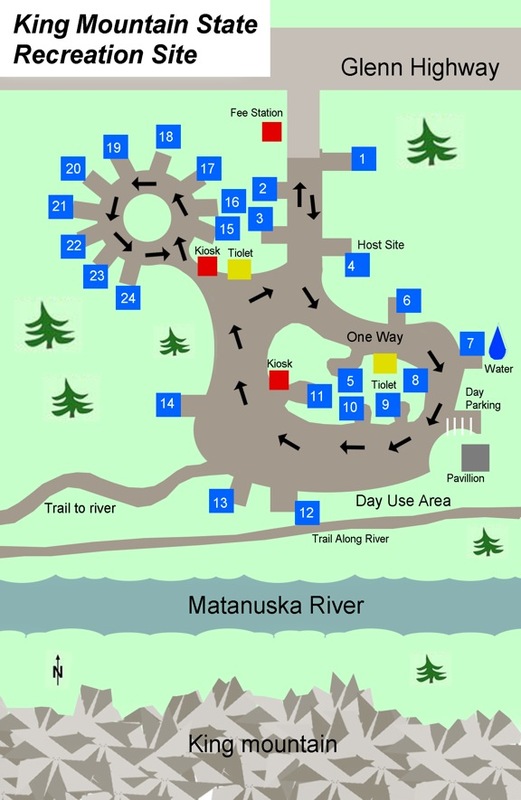 Nestled beneath King Mountain on the banks of the Matanuska River, this convenient park offers beautiful river scenery and peaceful camping. King Mountain SRS is 20 acres and has 25 campsites, picnic area, toilets, a picnic shelter and water. This quiet Park is located just off the Glenn highway at Mile 76, in Chickaloon. It is near excellent fishing Lakes and miles of off road trails. Take the Glenn Hwy. eastbound to Mile 78.6, Chickaloon. The Park is located on your right, across the highway from the Post Office. 1. Medium site suitable for Tent, Truck Camper or RV. Partial shade, parking 10X25. 6. Large site suitable for RV, Camper or Tent camping. Full day sun, next to lavatory. 7. Large site suitable for RV, Camper or Tent camping. Full day sun, next to lavatory. 8. Medium site suitable for RV or tent camping, partial sun. *Site is next to public water pump, access cannot be restricted. 9. Large site suitable for RV, Camper or Tent camping. Full day sun, next to lavatory. 10. Medium site suitable for RV or Camper. Full day sun. 11. Large site suitable for RV, Camper or small tent. Full day sun. 12. Small Site suitable for small RV or camper, sun, riverside. 13. Large site suitable for RV or Camper, partial shade, riverside. Parking area 15X30. 14. Large site suitable for RV or Camper, partial shade. Parking area 15X30. 15. Small site suitable for small RV or truck camper, full shade, next to restroom. 16. Small site suitable for small RV or truck camper or medium tent, full shade. 17. Small site suitable for small RV or truck camper or medium tent, full shade. 18. Small site suitable for small RV or truck camper or medium tent, full shade. 19. Medium site suitable for RV or truck camper or medium tent, full shade. 20. Medium site suitable for RV or truck camper or medium tent, full shade. 21. Medium site suitable for RV or truck camper or medium tent, full shade. 22. Medium-Small site suitable for RV or truck camper or medium tent, full shade. 23. Medium site suitable for RV or truck camper or medium tent, full shade. 24. Medium site suitable for RV or truck camper or medium tent, full shade.